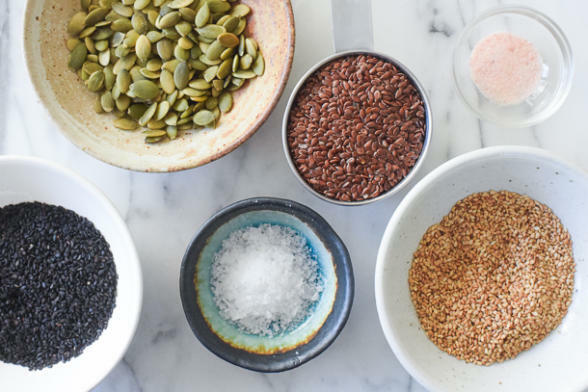 I’m conflicted writing about a recipe that comes from a book about detoxing and cleansing since I do neither. 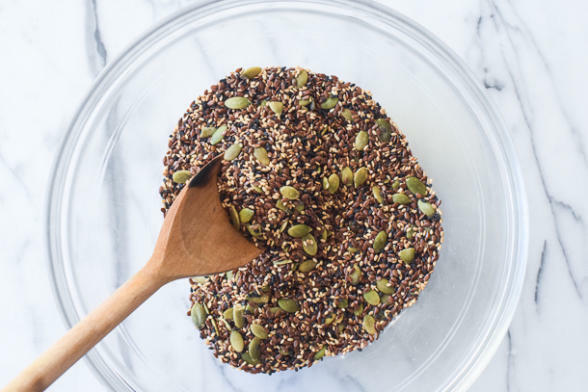 But I do like Gwyneth Paltrow’s taste in food and her style of cooking, so I knew I would find something delicious and healthy in her new book, The Clean Plate. Just to be upfront, GOOP sent me her book as a gift, along with some amazing body oil. Opinions are my own, but I always think you should read multiple reviews of books before committing. That said, I love crackers. I love them for breakfast with avocado or on top of soup or to scoop up some creamy dip. But crackers are usually not great for one’s blood sugar since they are typically made with refined flour. Plus it is so easy to overeat them. 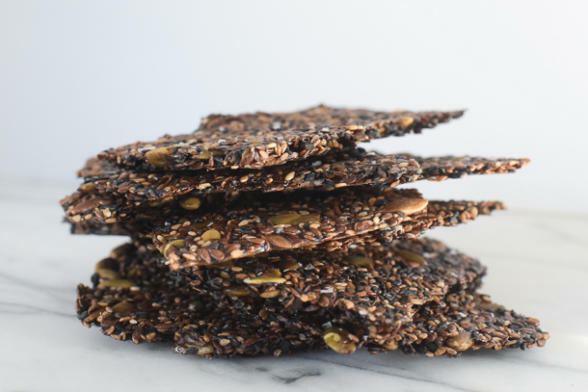 These seed crackers are truly nutritious with multiple types of seeds, packing a high fiber, high protein punch with good fats to boot. This is my trifecta for feeling satisfied and keeping blood sugar levels stable. Blood sugar stability is the name of the game, people. These were super easy to make and truly turned out just like the photo in her book. As you know, I think flaky salt makes anything taste better and these crackers are no exception. In her book, she shows the crackers with avocado on one page and smoked salmon on another. But I think vegan cream cheese and pickled vegetables would be great, too. 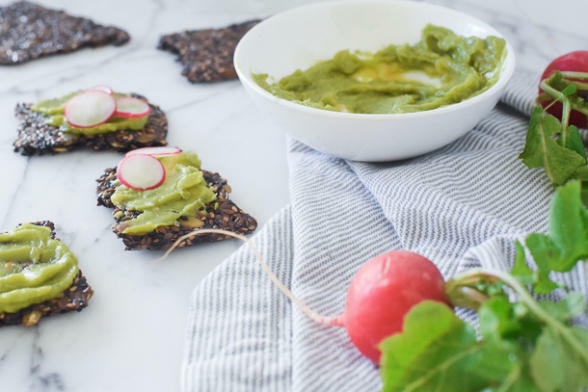 I’m definitely not encouraging anyone to do a cleanse, but instead just share an easy and healthy cracker recipe that you could keep on hand for breakfasts on the go, lunches, or even on a cheeseboard. Or does putting cheese on a seed cracker negate the healthfulness of it?? I think a thin slice or a schmear is just fine. Let me know if you make these, and if so, what toppings you add! In a medium bowl, mix together all the ingredients except the flaky salt. Let sit for 15 minutes to firm up. Transfer to a baking sheet and carefully peel off the top layer of parchment (go slowly, as a few seeds may stick to it.) Sprinkle with flaky salt and bake for 45 minutes. If the crackers don't seem dried out on the bottom, turn off the heat but leave the pan in the oven with the door closed for 30 minutes. Check the crackers and leave them in longer if necessary. Allow to cool, then break the cracker into large pieces and store in an airtight container for up to 1 week. Hi, just wondering the calories in this or the nutritional info? Worked perfectly for me… delicious!! Hail to the queens GP & PS!! I had the same result as Terri. I was able to salvage it by turning it over onto a fresh piece of parchment and peeling the wet paper off (with some difficulty as the bottom was pretty sticky) and baked it at 325º for another 30 minutes and it did get crisp enough to break into pieces when it cooled. Because the cooking time was longer at that temperature, it had a slightly overdone taste but I liked the combination of seeds so I might try it again with a dehydrator. Hi Freda, see my response to Terri. I will put this same advice in the notes of the recipe as well. Thank you! The same thing happened to me and the parchment paper stuck to the bottom which made it difficult to salvage. I tried it twice. I’m going to try Pamela’s tip below but am still worried about the parchment appear sticking to the bottom, more so than it not cooking all the way. Any suggestions? I think leaving it in the oven with the power turned off is the way to go. Another solution is to roll between plastic wrap and cook the cracker directly on the baking sheet. Hi Terri! The problem with my taking other people’s recipes is that they are not tested by me as much as I test my own recipes. I have had limited experience with Gwyneth’s cracker recipe, but I did not encounter this problem. What I would do next time is if the cracker is not dried out after your timer goes off, turn the oven completely off and leave the pan in the oven with the door closed. The residual heat will dry out the cracker without burning or cooking it. Check on it after 30 minutes and another 30 if necessary. I hope that helps!